This Shabbat is one of the four Jewish New Years set forth in the Mishna. Tu Bishvat, or Jewish Arbor Day, occurs on the fifteenth day of the Hebrew month of Sh'vat. In addition to being a birthday for trees, the holiday is deeply connected to the agricultural cycle of the Land of Israel and in modern days has become a day for celebrating the environment and reminding us of our responsibility as good stewards of the land. At the core of this ethic for environmental stewardship is the concept of bal tashchit – the ban on wonton destruction of the earth’s resources. This environmental principle, which includes waste reduction, should be a focus on the holiday of Tu Bishvat. This value was articulated in a presentation I heard last month while I was visiting Israel. Together with a dozen of my rabbinic colleagues, we toured the headquarters of SodaStream, the makers of consumer home carbonated water products. Daniel Birnbaum, the CEO of publicly traded SodaStream, explained to our group the positive environmental impact of his products. "This is the new way to do soda. We're revolutionizing it with a smarter way to enjoy soft drinks." In his presentation to our group, Birnbaum showed how SodaStream reduces the amount of packaging waste from cans and bottles. The company, he explained, also eliminates much of the pollution caused by the transport of bottled beverages. SodaStream has sponsored initiatives promoting waste reduction and improved quality of tap water. In his PowerPoint presentation, Birnbaum explained the alarming statistic that "460 billion bottles and cans manufactured every year, of which the vast majority are dumped as waste across parks, oceans and landfills." In its most aggressive marketing campaign alerting the international community to the negative effects of plastic bottle waste, SodaStream displayed a 318-square foot cage in several countries. The cage contained 10,657 empty bottles and cans showing that the waste produced by one family over the course of five years from beverage containers can be replaced by a single SodaStream bottle. The "Cage Campaign" has now been on display in over 30 countries. This aggressive marketing campaign erupted into controversy when one of SodaStream's cages was erected in Johannesburg, South Africa in 2012. Coca-Cola demanded that SodaStream remove all of the empty products from the cages bearing Coca-Cola's trademark logos and threatened to sue SodaStream if they didn't comply. Birnbaum not only rebuffed Coca-Cola's demands, but he went on the offensive by ordering the display of one of those cages right outside Coca-Cola's headquarters in Atlanta. Controversy is obviously something Birnbaum isn't afraid of. Over the years he has taken a lot of heat for the location of SodaStream's world headquarters in the territories outside of Jerusalem in the West Bank settlement of Mishor Adumim. The European Union's highest court ruled in 2010 that SodaStream was not entitled to claim a "Made in Israel" exemption from EU customs payments because of the company's primary manufacturing plant is technically located outside of Israel. Human right's groups like Peace Now have long objected to SodaStream's operations in the territories and publicly disparage SodaStream on the web. Pro-Palestinian activists who advocate consumer boycotts of goods produced outside of Israel's green line have protested SodaStream around the globe, saying the company has profited from Israel's occupation of the West Bank. They say Palestinian workers suffer from low wages and poor working conditions at SodaStream, but Birnbaum argues that none of that is true. For his part, Birnbaum claims he is a strong proponent of human rights, and that thanks to SodaStream thousands of local Palestinians in Mishor Adumim have good paying jobs. Those workers, he explains, would not be able to support their families without their jobs in SodaStream's manufacturing plant. In an effort to capitalize on SodaStream's success, Birnbaum will be spending approximately $3.8 million on a 30-second spot during next month's Super Bowl. Its recent "Setting the Bubbles Free" commercial, showing hundreds of soft drink bottles exploding when a person uses a SodaStream machine, was banned in the UK when television advertising monitoring agency Clearcast argued that it denigrates the bottled drink industry. Birnbaum is considering legal action in the UK and has countered publicly by asking, "Are we really being censored for helping to save the environment? This might be the first time in the world when an environmental approach has been shut down by the media to protect a traditional industry." It will be interesting to see what Birnbaum and SodaStream have in store for the over 111 million Super Bowl viewers around the world. I was quite impressed listening to Birnbaum speak passionately about SodaStream's products and its environmental concern for the global good. The former CEO of Nike Israel (he also gained experience at Pillsbury and Procter & Gamble), was raised in a home in which strong Jewish values were preached. Birnbaum's father was a Conservative rabbi who emphasized the importance of the State of Israel and philanthropic giving (Birnbaum is a major donor to the Masorti Judaism, the Conservative Movement's Israeli affiliate). 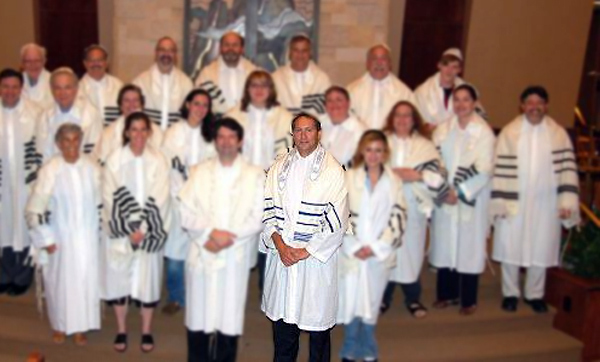 While Birnbaum, a Harvard MBA, is committed to his life as an executive businessman, he also gets a chance to participate as a leader in a synagogue for a few days each year. He travels to Cincinnati to serve as the High Holiday cantor of Adath Israel Congregation each Rosh Hashanah and Yom Kippur along with his wife Bat Ella, an accomplished Israeli musician. As Tu Bishvat approaches, I would encourage people to learn more about SodaStream and its positive impact on the environment. Yes, it is a publicly traded company on the NASDAQ with major investors and a goal of becoming a billion dollar company, but it also has a vision based on the Jewish concept of Tikkun Olam -- improving our earth. SodaStream will never be loved by the BDS (boycot-divest-sanction) movement, pro-Palestinian groups, or the big soda corporations like Coke and Pepsi. However, it is making a great product, putting thousands of at-risk Palestinians into the work force, and trying to make an impact in reducing the world's waste from bottles and cans. I guarantee that after SodaStream's Super Bowl commercial airs, Daniel Birnbaum will be the topic of conversation around the world. He's a guy who should be admired, not denigrated. So on this Tu Bishvat I hope people drink a soda water L'chayim to Daniel Birnbaum, set the bubbles free, and pledge to help eliminate waste caused by all those unnecessary plastic bottles that are ruining our environment. Happy Tu Bishvat! 3) I believe strongly in human rights and don't want to see the Palestinians (or any people) abused or forced to work in poor working conditions. 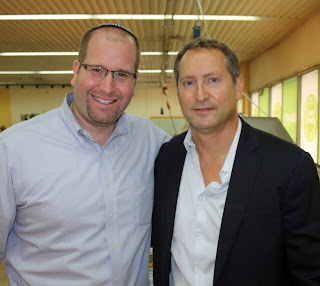 4) In December 2012 together with a group of about a dozen Conservative rabbis, I toured the SodaStream facilities and spent 2 hours with CEO Daniel Birnbaum, the son of a Conservative rabbi. 5) I PROMISE you all that I went into SodaStream that day with a completely open mind. I was prepared to determine that the company was situated beyond the Green Line simply to exploit the local Palestinian people... and I was prepared to determine that SodaStream is a reputable company that is doing good in the world. 6) I left SodaStream feeling very positive about the company and Daniel Birnbaum as the leader. He was very open about all of the accusations leveled against him and his company. He talked about the Palestinian workers at SodaStream (we met with them and asked them questions). 7) I was very impressed by the company's commitment to the environment and reducing bottle waste. Yes, they are also in it to make money and make their investors rich, but there is a strong environmental commitment too. 8) Most of the arguments leveled against Birnbaum and SodaStream are coming from a very anti-Zionist, anti-Israel (and in some cases anti-Semitic) populace. This BDS movement doesn't consider any of the points I made here. They simply don't want any Israeli companies to succeed (whether they're situated in Tel Aviv or in the territories outside of Jerusalem). 9) I was very impressed by the products they're making. Simple machines that made delicious soda water. To be honest (and I don't get anything for this testimonial), my family doesn't buy bottles or cans of soda anymore. We make our own. That's significant because in Michigan with a 10-cent return deposit, we no longer have to spend the time at the grocery store returning our bottles. We don't have to keep buying 12 packs of Diet Coke. We don't have a stockpile of plastic seltzer water bottles in our pantry anymore. It's a noticeable difference. 10) I felt very confident writing what I did about SodaStream. I felt like I did my research and got right to the source (talking to people at SodaStream including Birnbaum and other executives AS WELL as talking to the workers in the factory (both Israeli Jews and Palestinians). I waited almost two months to publish my writing because I wanted to make sure I understood all of the issues. I wish I recorded the talk that Daniel Birnbaum gave my group of rabbis from the Conservative Movement. It was a passionate and genuine (I have a good read on people) talk about not only his commitment (through SodaStream) to the environment, but also to his workers (most of whom in that production facility are Palestinian). All of the rabbis who heard that talk were visibly moved as we hopped back on the bus after a 2 hour visit at SodaStream. I posted a photo of SodaStream to Facebook and remarked about what an amazing company it is. I wasn't expecting any push back, but almost immediately a rabbinic colleague back in the U.S. began commenting about what a shame (my word, I don't recall exactly what she wrote) it was that this company was exploiting its workers and was located in the settlements.